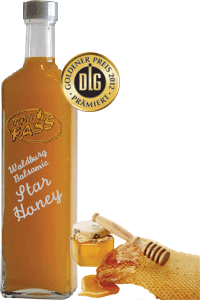 The starting point for this star specialty is our honey balsamic vinegar. After adding selected blossom honey, this star matures at a constant temperature in oak and acacia barrels, giving it the finishing touch and gentle nuances of vanilla. A great combination of sweetness, acidity and a wonderful variety of aromas - as extraordinary as can only be found in a real star product!